North Star Cruises has announced details of a brand new cruise in the mysterious waters of West Papua. 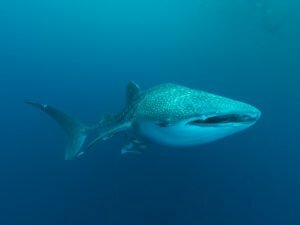 The Whale Sharks of Cenderawasih Bay itinerary is bound to capture the attention of wildlife enthusiasts around the world. This discovery cruise was originally commencing in 2013, although due to a recently obtained Government permission, North Star Cruises is now able to bring this much anticipated event forward to October 2012. The whale shark (Rhincodon typus) is the biggest fish in the sea! They can grow to more than 12 metres in length and although there are several places in the world where snorkellers can experience a close encounter with these gentle giants - the dedicated adventurers at North Star Cruises are pretty sure that nothing compares to a whale shark encounter in Cenderawasih Bay. TheWhale Sharks of Cenderawasih Bay itinerary also features diving, snorkelling, game fishing, helicopter flights, shore excursions and cultural experiences, and of course, the on-board indulgence of the TRUE NORTH. Guests are delivered to the luxury cruiser via a private yacht charter flight from Darwin. The single itinerary runs from 18 to 28 October 2012.